Are you up for a talk about retirement? As the saying goes, “it is never too early to start”. According to the Federal Reserve, in 2016 families with a head of household under the age of 35 had only $32,500 in retirement accounts while age 55–65 had only $374,000¹. These would be very difficult numbers to retire under, especially with growing health care costs and life expectancy. In America, we do not like to talk about money and financial health with friends and family. If you are part of the lucky few, your parents would guide you. However, for many this isn’t an option because our parents have not invested for retirement themselves. After all, parents cannot teach us what they do not know. Instead we look towards financial blogs and Reddit to guide us. To assist you in this confusing process, we compiled a guide on the best investing habits and rules to follow. Below are a simple investing flow chart, explanations of the terminology, and a walkthrough for each of the steps. The first and the most important step is building an emergency fund. This is not specific to investing, but more of a general financial health advice. An emergency fund is money you keep in a savings account for unexpected financial emergencies such as job loss, medical expenses, car repairs, or home repairs. Usually, the fund is at least 3 months of living expenses, but can be more. In the unfortunate event you have to deplete your emergency fund, it is best to replenish it as quickly as possible. No one ever knows what a 401(k) is until their first full-time job. If your job offers a 401(k) then the Human Resources department should notify you. A 401(k) is an investment account with tax benefits meant to help you save for retirement. Many companies offer to match a percentage of your salary, which means they will give you FREE money to aid your retirement as long as you invest the required amount. As of 2018, you can contribute at most $18,500/year to your 401(k), not including your company’s contribution. An important note to keep in mind is that you need to pick your own investments (usually mutual funds) in your 401(k). Your money is NOT automatically invested for you. Also, you SHOULD NOT withdraw from your 401(k) until 59 ½ years old. If you choose to withdraw, you will face a penalty and it will hurt future you. Thankfully, you have an emergency fund and are unlikely to withdraw from your 401(k). We will attach more information about 401(k) at the bottom. 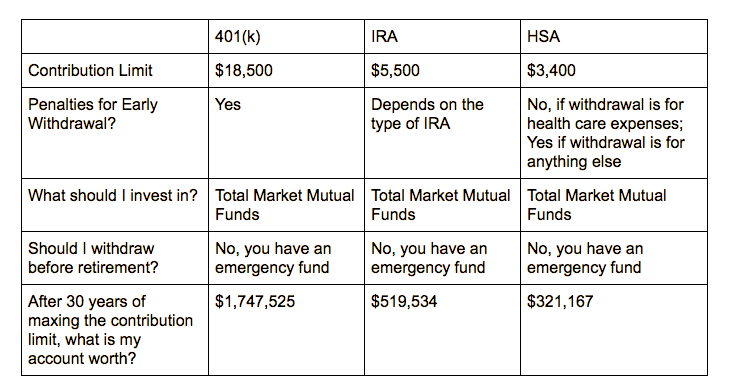 An IRA is another investment account with tax benefits. Most of the time, you have to set up your own IRA and generally, no one guides you through the process. Most brokerage firms will offer IRAs and investment options. As of 2018, you can contribute at most $5,500/year to your IRA. Similar to the 401(k), you need to select your own investments and your money is NOT automatically invested for you. Depending on the type of IRA (Traditional or Roth), you may or may not have a penalty when you withdraw before 59 ½. Ideally, you should not withdraw until you retire or reach 59 ½. We will attach more information about IRAs at the bottom. HSA is another investment account with tax benefits available to those with a high-deductible health insurance plan. The best way to have access to an HSA is through your company, but you can set up your own as well. As of 2018, you can contribute at most $3,400/year for an individual ($6,900 for a family) to your HSA. You can invest the money you put into an HSA, tax-free. Similar to the 401(k), you need to select your own investments and your money is NOT automatically invested for you. Before age 65, you are only allowed to withdraw from your HSA for health care expenses; otherwise, there will be a penalty. When you are age 65 and older, you are free to withdraw from your HSA for any reason without any penalties. The Warren Buffett Itch is a concept we came up with to explain why people feel the need to take excessive risk to invest in individual stocks and how to address this. The general rule is have at most 5% in individual stocks and the remainder in total market index funds. We have disclosed the total market index funds that we are invested in and believe it is the best path toward securing financial freedom and generating wealth. Below is a walkthrough of a make-believe person with references to many banks and financial solutions. A quick disclaimer: at the time of publishing this blog post, we are not sponsored by any of the banks or financial solutions listed below. We are merely speaking from our own experiences. Jack is a 22 year old college graduate starting his new job next week. He has to figure out his personal finances and how to save for retirement over this weekend. His new job is in New York City. Luckily for him, Jack has learned how to budget and survive in one of the most expensive cities in the world. The key to living in New York City is move in with roommates and rent in the outer boroughs such as Brooklyn or Queens. Although Jack’s commute time to work everyday is 1 hour, his rent is much more affordable. Lunch in the city can easily be $15 per meal and dinner can be $25 per meal. He quickly learned cooking at home and bringing lunch to work will save a great deal of money and also has health benefits. At the end of each month, Jack has a whooping $1,338 to save and invest. Let’s walk through the flowchart to determine how Jack should use his money in the next few months. Right now, Jack doesn’t have an emergency fund. His number one priority is building a 3 month emergency fund and storing it in a high yields saving account. He can setup Marcus by Goldman Sachs or Discover Online Saving or another high yields saving account. To calculate his emergency fund, we add up the monthly expenses and multiply it by 3. Jack has to save $4,920 for his emergency fund. He will put his remaining $1,338 toward his emergency fund for 4 months to save up this amount. Here is the relevant spreadsheet. By the 4th month since starting his job, Jack has saved enough for his emergency fund and should start contributing to his 401(k). His company offers a 401(k) through Fidelity, which will likely offer low cost total market index funds such as FSTMX. Luckily, his company offers a 5% match. This means when Jack contributes $2,500 (5% of $50,000), his company will also contribute $2,500 for a total of $5,000. In other words, free money. Every month, Jack will be putting in $208.33 toward his 401(k) and investing in FSTMX. For the sake of simplicity, Jack will be contributing to a tax-deferred traditional 401(k). When Jack retires and withdraws money, he will pay taxes then. Here is the relevant spreadsheet. His 401(k) contributions are located in his monthly pre-tax deductions (notice how his take-home is lower). This is because money comes out of his paycheck before it is taxed. Now, Jack has $1,246 left to save each month toward retirement. Jack has more than enough to contribute to his IRA, which has a yearly max of $5,500. He can choose to start an IRA with any brokerage firm of his choice. For simplicity, he will go with Charles Schwab and open a Roth IRA. A Roth IRA means his contributions are post-tax. When Jack retires and withdraws money, he will not have to pay taxes because he has already paid them. Similar to Fidelity, Charles Schwab offers low cost total market index funds such as SWTSX. Each month, he will contribute $458.33 toward his IRA and invest in SWTSX. Here is the relevant spreadsheet. Since he will be contributing the $458.33 post tax then it will come out of his $1,246. Jack would still have $787.67 each month. There is still the max yearly 401(k), HSA, Warren Buffett Itch, and individual brokerage steps in our flow chart. Unfortunately, there isn’t much Jack can do right now without raising his salary. He can use the remaining $787.67 for whatever he wishes including spending more on rent, eating out, and having fun in general. Below is a chart of his investments growth over time from age 23 to 65 if he only maxes his IRA and 401(k) minimum match each year. We aren’t taking account taxes, but to be fair we are assuming Jack has a salary of $50,000 for the next 43 years. If his salary goes up, he can put away more for retirement. If Jack can retire at 65 with $2,783,768.94 and on a fixed salary of $50,000 living in New York City then so can you. Everyone’s situation is different so let us know if you want us to walk through other financial situations. We aren’t accounting for college debt or large asset purchases such as houses so if you are interested in hearing more of those situations and want us to run the numbers, then let us know! Feel free to copy our spreadsheet and use it yourself. There should be simple steps to help you calculate taxes and salary on smartasset. Happy to answer any questions about our methodology. Additionally, if you would like to request a specific topic you want to learn more about, please let us know in the comments section below or email us at alan@tomoonfund.com!